When EOL happens, EOSL follows. But you just bought a new line of hardware. Why should you be thinking about End of Life or End of Service Life so soon after your purchase? While you don’t need to immediately plan an exit strategy for those brand-new units, you certainly want to make sure you are educated on the matter, and that you have a plan-of-action for when the OEM does announce those dates. 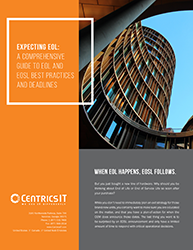 The last thing you want is to be surprised by an EOSL announcement and only have a limited amount of time to respond with critical operational decisions. When you blindly follow EOL and EOSL dates, you are in the OEM’s pocket. But you do have alternatives. When considering a switch to TPM for support contracts, our clients have often expressed initial concern over “losing access” to OEM expertise, services, and (especially) updates and patches. Download the datasheet today to learn the truth about OEM updates and how you can start experiencing the same level of service for a fraction of the cost.